Set goals for your time with a personal time tracker. Set the minimum or maximum amount of time you want to put into a task. Spend 'at least' 1 hour getting exercise, or 'at most' 30 minutes checking e-mail. Set the days on which your task repeats, and My Minutes will only remind you about it then. Build up streaks of green as you meet your goals. Keeping your streak alive will motivate you to keep going tomorrow. To get started, you simply set up a goal: "Do at least 30 minutes of exercise." 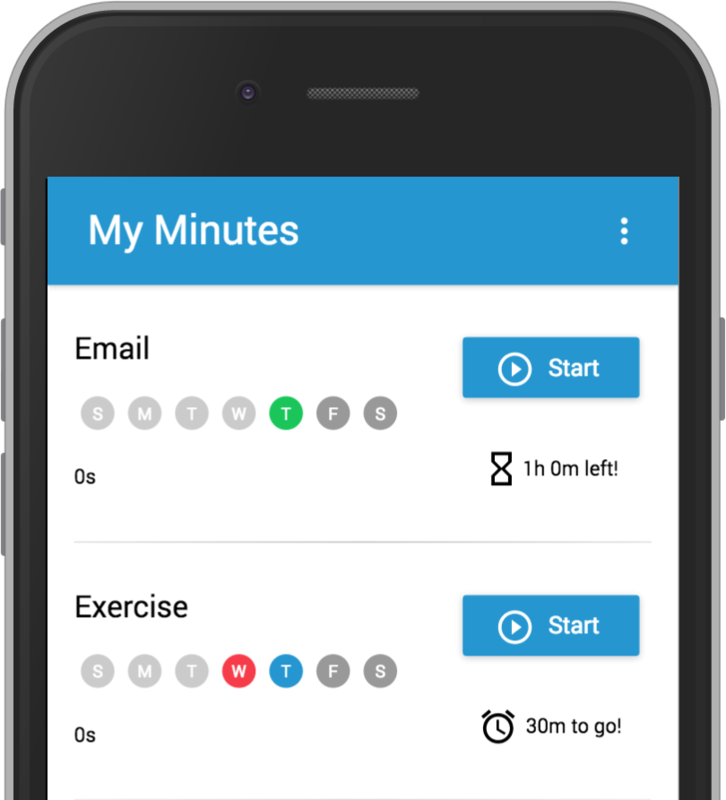 By tracking your time, My Minutes lets you cut time away from less important things to put to work elsewhere. Only getting 20 minutes of exercise most days? That's great, because those remaining ten minutes must be going somewhere. Say you notice you're spending about 1 hour and 20 minutes a day dealing with email. Yikes! With My Minutes, you can set up another goal: "Do at most 1 hour of email." By freeing up 20 minutes, you dedicate 10 more minutes to getting exercise and hit your goal. Using "at least" and "at most" goals, My Minutes delivers a two-pronged boost to your productivity. You cut down on wasted time, and spend that time being more productive. Looking for the original version of My Minutes? It's in the App Store. Have an idea that'll make My Minutes better? I want to hear from you. Tweet or email me your thoughts. I'll respond as quickly as I can. Created by Kamil Tusznio © 2016 Earlier Labs Inc.